Winter has arrived in many parts of the country, and that means a hazardous situation awaits you nearly every time you get behind the wheel. 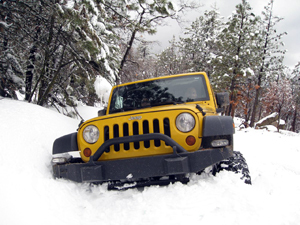 You may know how to drive in snow, but do you know what to do if you were stuck in snow? Recently, drivers on I-90 near Buffalo, N.Y., were trapped for up to 12 hours when a massive blizzard hit the area. Some cars were literally buried in snow. If you were caught in a situation like that, would you know how to handle yourself? Every situation is unique, but the following guidelines apply in all situations, and could save your life. I highly recommend you copy this article to your laptop or other device. You’re likely to have that with you, but you may not have access to the Internet. A PDF copy is available here. Created on 16 December 2010 . It’s easy nowadays to rely entirely on a GPS receiver to direct you during a trip. Just program in your destination, and let the friendly voice and digital map guide you along the way. But like any electronic gadget, a GPS unit has its limitations, and you can end up in trouble if you’re not careful. Plus, they can lose power or break, leaving you stranded if you don’t have a back up. GPS units are of limited use when you’re driving off road. The maps and other data they provide tell you how to get from Point A to Point B, but they say nothing about the quality of the roads. This became painfully clear to a group that was traveling in the Grand Staircase-Escalante National Monument in early August. Instead of a leisurely ride, these folks found themselves being led down the wrong roads, many of which were barely passable, and way off course. They ended up at the edge of a cliff, where they spent the night before being rescued. The GPS system offered what appeared to be the most obvious route, which normally is the most direct, but it could not account for the quality of the roads. Their vehicles got stuck in sand, and in their attempt to backtrack they ran low on gas. But they were lucky: they got out alive. Created on 04 October 2008 . Four-wheelers are good about packing their vehicles with tools, tow straps, winch, food, water - you name it; they include it. One piece of equipment that often gets overlooked, however, happens to be one of the more critical items: a fire extinguisher. Remember that a fire could occur inside or outside your vehicle. Ever wonder what you’d do if your campfire or stove got out of hand? Or if your engine compartment started smoking? You may never experience a fire–and I hope you don’t–but if you do, you’ll be thankful you packed an extinguisher. Many smaller fires can be snuffed out quickly and safely. Created on 21 September 2008 .